Right-to-Work Statements: True or False? During the discussion of House Bill (HB) 116, commonly known as Worker Freedom or Right to Work (RTW), both as it was being passed during session and leading up to the veto override on September 16th there has been a great deal of misleading and downright false statements made about RTW. Most of these statements come from union talking points that sadly a lot of union members take as gospel and cannot be confused by the facts. Even sadder is the fact that some legislators cannot be persuaded by truth but remain against RTW for personal reasons that in the end damage the vast majority of their constituents. United for Missouri has put together a True or False evaluation of the most often repeated claims and statements about RTW. True or False – RTW will lower wages. The answer is FALSE – Increased demand for workers raise worker wages; the percentage of real growth private-sector employee compensation grew 15.1% in Right to Work states from 2003 to 2013 as compared to just 8.2% in forced-union states. A Missouri specific economic study estimates that real per capita income (every man, woman and child in Missouri) would be $1,867 more today if RTW had been enacted 30 years ago. That’s over $5,600 more in the pockets of a Missouri family of three. True or False – Workers make less in RTW states. The answer is FALSE – Higher costs of living takes more income and leaves families with less; In 2013, when disposable personal income is adjusted, per capita for cost of living, workers actually made about $2,000.00 more per year in RTW states, as compared to forced-union states. True or False – RTW allows non-union members to freeload from union representation without paying the cost. The answer is FALSE – Unions voluntarily represent non-members; The Supreme Court has repeatedly ruled that the National Labor Relations Act allows unions to negotiate contracts covering only dues-paying members. 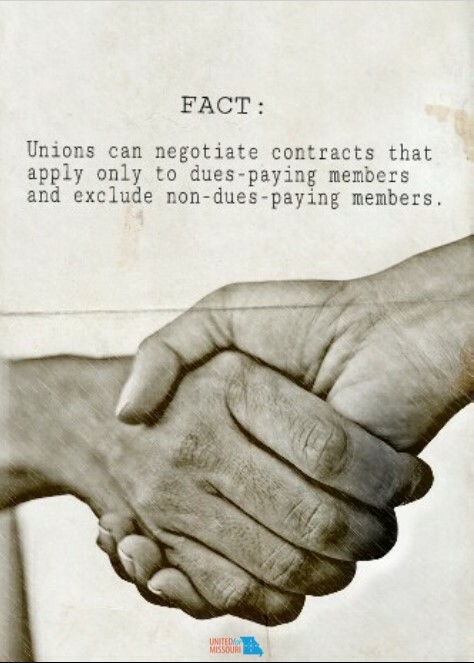 As Justice Brennan wrote in Retail Clerks v. Dry Lion Goods (1962), “‘Members only’ contracts have long been recognized.” Unions represent non-members only when they act as “exclusive bargaining representatives,” which requires non-members to accept the union’s representation (forced union). In that case, the law requires unions to represent non-members fairly. They cannot negotiate high wages for their supporters and the minimum wage for non-members. Unions can avoid representing non-members by disclaiming exclusive representative status. True or False – RTW interferes with a business owner’s right to contract or hire union workers. The answer is FALSE – Employers can still require the same level of skills and training as they do today; HB116 does not prohibit any employer from hiring union workers or require the hiring or firing anyone not qualified to do the job the employer requires to be done. An employer can still negotiate a union contract. The only prohibition in HB116 is that the negotiated contract cannot require employees belong to the union in the contract. True or False – HB116 will criminalize business owners for inadvertent actions. The answer is FALSE – HB116 has language intended to ensure compliance identical or similar to most of the other RTW states; these provisions are common features of labor laws and right-to-work laws passed in other states (as well as other types of statutes). Contrary to what others may claim, “damages” in this bill are not open-ended and would not create a spate of lawsuits. Though other states have similar provisions, there have not been dramatic increases in criminal prosecutions or civil lawsuits in those states. HB116 language is a Class C Misdemeanor, the very lowest order of criminal violation known to the law. It’s unlikely that a business person cannot be guilty of violating the provisions of HB116 without knowingly doing so. True or False – RTW will take our state backward. The answer is FALSE – RTW moves a state forward by creating more jobs; Total private-sector, non-farm employment grew on average from 2003 to 2013 in RTW states by 16.2% and just 9.3% in forced-union states. True or False – RTW states are poor and have more people on welfare. The answer is FALSE – More jobs equals more opportunity; In 2014, Right to Work states averaged 5 residents per 1,000 on welfare (TANF), while forced-union states had 12.5 residents per 1,000 on welfare. True or False – RTW states have a higher rate of occupational deaths. The answer is FALSE to half-truth – workplace accidents have more to do with type of work than union vs RTW; RTW does not mean a state will have dangerous workplaces: the RTW states of Arizona, Nevada, and North Carolina have lower rates of fatal occupational injuries than the national average. And allowing forced unionism does not guarantee safe workplaces; of the four states with the highest rate of fatal occupational injuries, only one, Wyoming, has a right-to-work law. The other three most dangerous states, Montana, Alaska, and West Virginia, do not have right-to-work. The facts are clear: there is no economic reason to oppose RTW just myths and personal feelings. Voting “NO” on veto override of HB116 is a vote in favor of the status quo of economic stagnation and loss for our state and working Missourians. RTW will move Missouri’s economy forward making us more competitive and will create more opportunity for and put more money in the pockets of every Missourian! U.S. 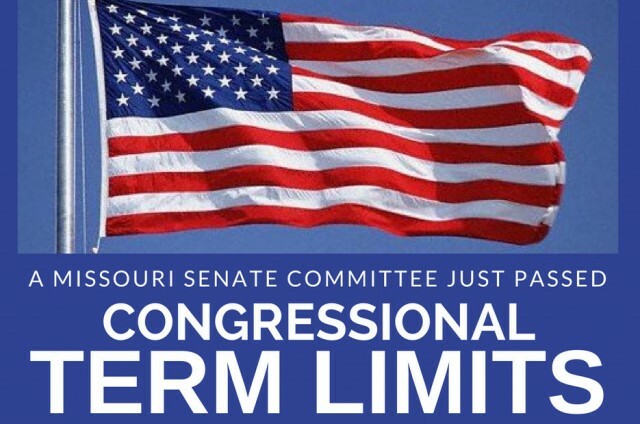 Term Limits Resolution Advances in Missouri Legislature! Everything in the posting above is pure propaganda. The real intent of the bill is to weaken unions and would allow scabs to take advantage of having union membership without contributing dues. The scabs, under the Taft Hartley act would allow non dues paying workers to enjoy the benefits of membership without being a memebors. They would get the same pay, the same health care, the same representation in disputes with management that union members have earned through years of contract negotiations. In short, the scabs would be getting a free ride at the expense of dues paying union members. Retail Clerks v Lion Dry Goods (1962) has never been changed – unions only have to represent their members – period. 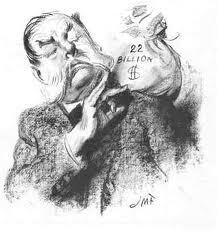 Unions CHOOSE to represent non-members who are required to pay “fair share”. They have no legal obligation to do so but they know if they didn’t, they wouldn’t coerce as many to pay them. The story in your comment is simply a fairy tale but one of the really bad ones since there is no truth in it. Everything in the posting above is pure propaganda! Scab workers would have all the same pay and benefits that have been earned through negotiations over decades by dues paying members. Scabs are nothing but freeoaders taking advantage of union membership while contributing nothing to deserve them. Everything in the post is documented. It’s the false allegations as contained in your comment that is propaganda.